Angela Tunner Has Created A Surprising And Enchanting Cookery Book! 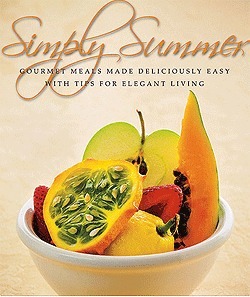 This book entitled "Simply Summer" will tempt anyone - even those like my-self who cook very little, to enter her world - her elegant style of beautiful foods made simple, natural and easy, and by doing so greatly enhance their appreciation and preparation of the dining experience. So tempting in fact, Angela Tunner’s book does not allow anyone to escape - once they open this book the charm she effuses and the lifestyle she advocates will do the rest... you may very well soon become the gourmet cook who can create such wonderful, memorable suppers for beloved friends. No resistance could be offered either on grounds of practicality – the shopping list is written, and your are asked to keep it by the door in an attractive basket so that you don’t go out of the house to shop without becoming the embodiment of effortless elegance that she wishes for you! What makes this book so thoroughly engaging and unusual kept me smiling page by page. If you were ever charmed by the etiquette books of the 1930’s and 40’s, as indeed I was, then you will very much enjoy Angela’s cookery book set in this style, offering in the same way indispensable tips for correct ‘form’; delightful details of modes and manners, nowadays lost but brought forward in modern terms here for an effortlessly chic approach to home and friends, family or even savouring a quiet, summer dining moment alone. Not much of a cook myself (I lived for some years on raw foods), with a no-nonsense attitude to foods (sensible eating is everything) and almost no experience of cooking for others (as I hardly ate anything beyond salad and yoghurt) I was nervous at the prospect of reviewing a cookery book! All practicalities are taken care of, as if arranged and set in place by our hostess, Angela Tunner, and there is one more surprise; there is barely any cooking to be done before the meal is ready and company is invited to share the occasion. Breakfast, lunchtimes and supper-evenings, or even a long cool drink with some friends in the sun, have, in this book, all have become tempting delights of colour, taste and creativity. These are meals designed to be delightful and easy, and yet much more than this, Angela has done something to make each one memorable in a new and very appealing way, by adding ambience; personal touches and dedication, with perhaps an unexpected flavour to hint at journeys travelled beyond the garden walls, and a twist of the exotic to refresh the senses, these are not meals for languid occasions. 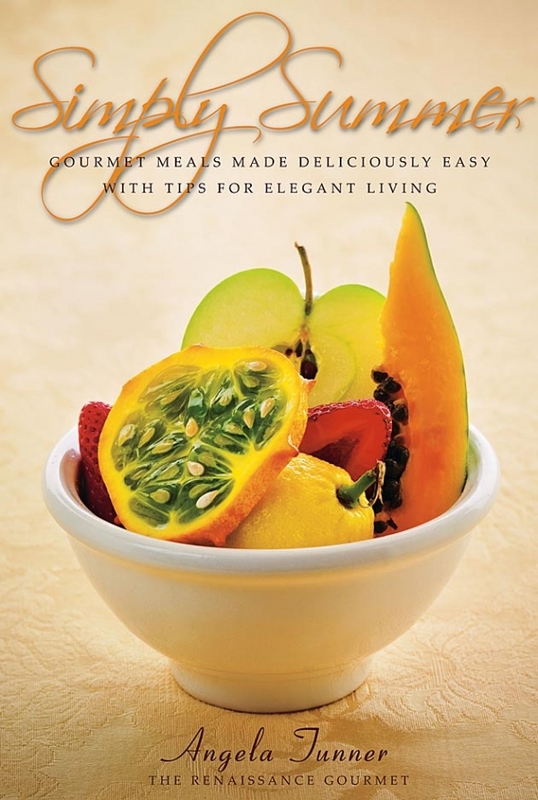 Angela’s book will help you to create many memorable and exquisite dining experiences, as you will see. Victoria Whiteland is a Couture Designer based in Wales - UK, specialising in Corsetry. She creates unique Corseted Bridal Wear, Ball Gowns, Wedding Trousseaux, Evening Wear, Lingerie, Historical and Theatrical Costumes. Over the last 18 years her Couture Corsetry designs have been seen in some of London's best boutiques, some excellent Welsh boutiques and has been shown several times on Television and in Magazines. Take a look at Victoria's profile story - Victoria Whiteland - Couture Corset Designer - A Life in Stitches on Par Excellence Magazine's Profiles--Women Making a Difference section.